Buildings can be subjected to adverse incidents like accidents (vehicle collisions, explosions, and so on), natural disasters (tsunamis, hurricanes, earthquakes, and flooding), and actions such as sabotages and terrorist attacks. These incidents cause damage to their structure, which can result in a complete collapse. This is where the term “progressive collapse” arises, the process whereby localized damage can lead to a sequence of chain errors that result in the total collapsing of the building, or a considerable part of it. This collapse can in turn result in extreme personal and material losses. A group from Valencia’s Polytechnic University (UPV) has created a research project led by professor José Miguel Adam, and supported by a Leonadro grant, the outcomes of which will contribute to avoiding this collapse, thereby ensuring improved robustness and safety for the buildings. In the project, investigators introduced a set of design recommendations in order to realize these more robust and durable buildings. The work of UPV investigators has concentrated on the corner columns. Professor Adam states that one of the conditions that will most likely result in the progressive collapsing of a building is when the localized damage impacts these columns. Therefore, the scientists suggest a new design in which the load of the corner column is distributed through the rest of the building in case of an adverse incident. It is about defining design techniques that make it possible to create alternate load paths so that, when a column falters, its load is redistributed among other elements of the building. In essence, buildings have resistant mechanisms that do not activate under normal situations, but which can be of great importance when withstanding an extreme event. It is the possible activation of these mechanisms where improvement of the building’s resistance to collapsing is focused on. José Miguel Adam, ICITECH, Valencia’s Polytechnic University. In collaboration with Professor Adam, the research group includes Elisa Bertolesi, Manuel Buitrago, and Pedro Calderón, all from the Concrete Science and Technology Institute (ICITECH) of the UPV. In addition, the project also involved the partnership of scientist Juan Sagaseta, from the University of Surrey. So far, corner column errors have been investigated very rarely, chiefly as the works carried out have only taken scaled parts of buildings into accounts, which were tested in the laboratory. In this research, scientists constructed the first Spanish full-sized test building with these design recommendations. The company Levantina, Ingeniería y Construcción – LIC has co-funded the construction of the building and the tests carried out. 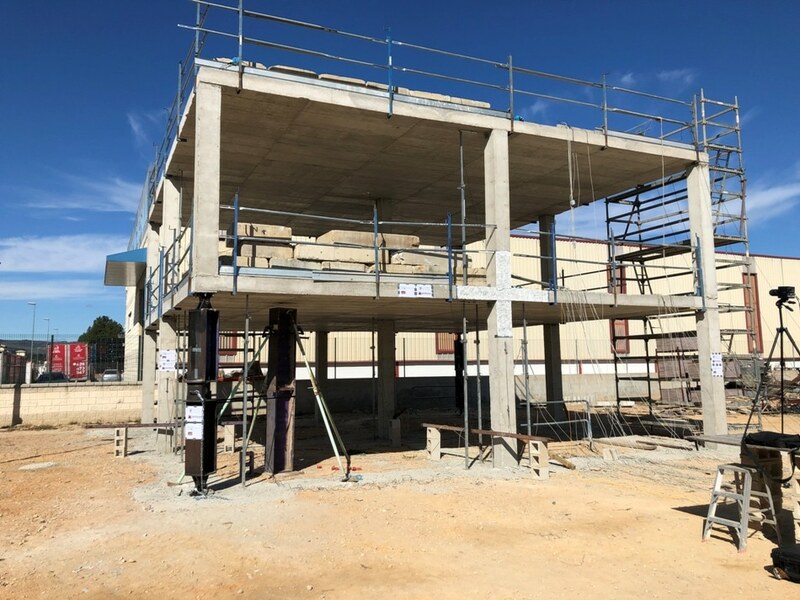 The test building has been supervised using a range of high-tech sensors, particularly strain gauges, movement sensors, sensors which enable monitoring of the deformation inside concrete, and accelerometers, both electrical and optic fiber-based. In addition, many cameras were also employed to evaluate and envision the response of the building. “To have a test building fully at the disposal of the project has led to very trustworthy results which, in turn, will contribute to understand resistant mechanisms in buildings which had hardly been analyzed to date,” emphasizes José Miguel Adam. With the development of this project, it will be possible to decrease the vulnerability of critical buildings (hospitals, schools, passenger terminals, and public and military buildings), of high occupancy or with a large number of storeys.